UC Irvine Chancellor Michael Drake and three faculty members recently concluded an academic mission in Israel, forging collaborative research agreements and student and faculty exchanges with the country’s top universities. 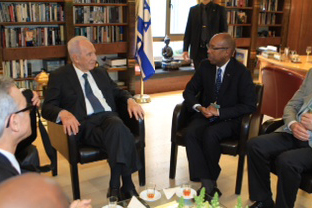 Among the highlights of the trip was a visit with Israel President Shimon Peres. Drake last visited Israel in 2008 to participate in an educational seminar hosted by Project Interchange, an organization that connects worldwide leaders with Israel. Accompanying him on this trip were Kenneth Janda, physical sciences dean; Gregory Washington, engineering dean; Dr. Zeev Kain, associate dean for clinical operations and chair of the Department of Anesthesiology & Perioperative Care in UCI’s School of Medicine; and Larry Gold, international programs assistant to the provost. They visited with leaders at Ben-Gurion University of the Negev, Hebrew University of Jerusalem, Technion - Israel Institute of Technology and Tel Aviv University. The academic teams began developing programs designed to enrich students and faculty for many years. Washington said his colleagues are arranging student and faculty exchanges in electrical, civil and environmental engineering. Plans are also in the works to establish a workshop on water resources with Ben-Gurion, a subject of critical importance to California and Israel.